Book your Big Island Luau Experience Today! A traditional Luau is the perfect addition to your Hawaii vacation. The delicious feast and lively festivities of luaus are some of the ways that the people of Hawaii have celebrated special occasions. The Big Island offers many fun and authentic luau experiences, suitable for all ages! For more information, check out some of the details from our favorite shows below and contact us by email or phone to book your Luau Experience today! Guests are invited to join in a cultural experience that shouldn't be missed. Held at the Courtyard Marriott King Kamehameha's Kona Beach Hotel in Kailua-Kona, this lū’au on the Big Island of Hawai’i fully absorbs its namesake into the show. 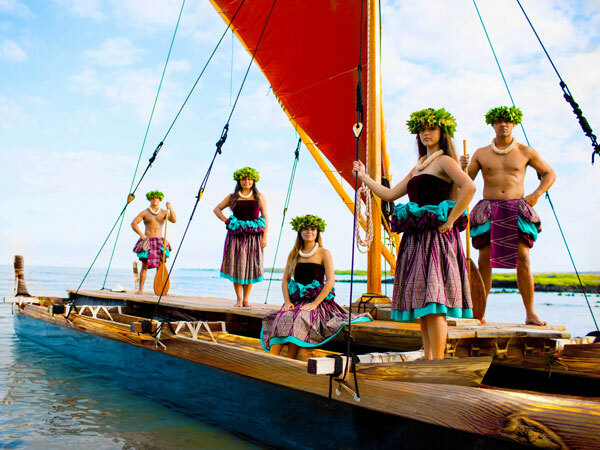 Watch as the Royal Court of King Kamehameha I as he arrives by canoe, his arrival greeted by a Court Conch Herald and a Court Chanter. Follow his procession into the royal grounds to experience a lu’au that truly deserves Hawaii's Royal title. The Island Breeze Lū’au, and amazing Polynesian production, is well known for its delicious food and location by the ocean. It is held on the beachfront of historic Kamakahonu Bay and Ahu’ena, Kamehameha the Great's former estate in Kailua-Kona. Guests of the Island Breeze Lū’au enjoy a backdrop of passing boats, outrigger canoes, and the lights of Kona and Mount Hualalai. The Island Breeze Lū’au features a 22 dish buffet, open bar, Polynesian arts & crafts demonstrations, and the Royal Court procession. Highlighting the evening is the spectacular Polynesian Revue. Held on beautiful grounds at the Fairmont Orchid in Waimea, Hawaii Loa Luau invites you to an authentic Hawaiian luau experience showcasing beautiful hula dancers and talented musicians who share the tales of Polynesia's courageous voyagers and retell the story of the settlement of the Hawaiian Islands through live music and dance. Hawaii Loa Luau showcases beautiful hula dancers and talented musicians who share the legends and tales of Polynesia's brave and courageous voyagers as they traveled to the remote Hawaiian Islands and established this land. One of the legends that explains the early settling of Hawaii is of Hawaiʻiloa, a great Polynesian navigator. It is said that he voyaged north from Tahiti and when he came upon the Hawaiian Islands immediately fell in love with the land. He travelled back and forth from Tahiti and gave the names of his children to each of the Hawaiian islands.